On the weathered corridor of the Hojo hall, an aged cat is catnapping peacefully to dream a brief dream. Like this old cat, we are dreaming the fleeting dream called a life. 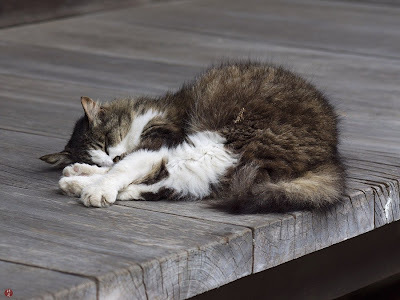 In the Zen temples of Japan, cats are traditionally cherished by temple people because they are believed to protect precious sacred books from the damage by rats.